Last week, millions of Americans unwrapped a shrink-wrapped turkey for Thanksgiving. If so, they owe thanks to electron beams, which made the shrink-wrapping possible. But the electron beam can do a lot more: It can sterilize medical equipment, treat wastewater and print metal parts. Industrial accelerators that generate these electron beams are rapidly expanding. The Illinois Accelerator Research Center (IARC) is on a mission to build a high-power, compact, superconducting electron beam accelerator that will serve all of these purposes. High-power linear electron accelerators are typically made of structures called cavities, which impart energy to the particle beam, thrusting it forward. One such cavity is the superconducting radio-frequency, or SRF, cavity, which requires extremely cold temperatures to operate. These machines use liquid helium to maintain the temperature necessary for sustaining superconductivity. Liquid-helium operation demands complex infrastructure: a liquefaction plant, distribution lines, gas recovery, purification systems, and cavity cryomodules that can withstand high pressure. Although such an infrastructure is appropriate for large-scale research accelerators, it can be too complex and costly for industrial applications. The barrier is the need for ultracold liquid helium. With Fermilab’s never-say-impossible spirit, our team at IARC has broken this barrier. We have for the first-time cooled an active radio-frequency cavity to cryogenic temperatures without the use of liquid helium. We achieved this by connecting a cavity to a commercially available cryocooler, using a Fermilab-patented technology. 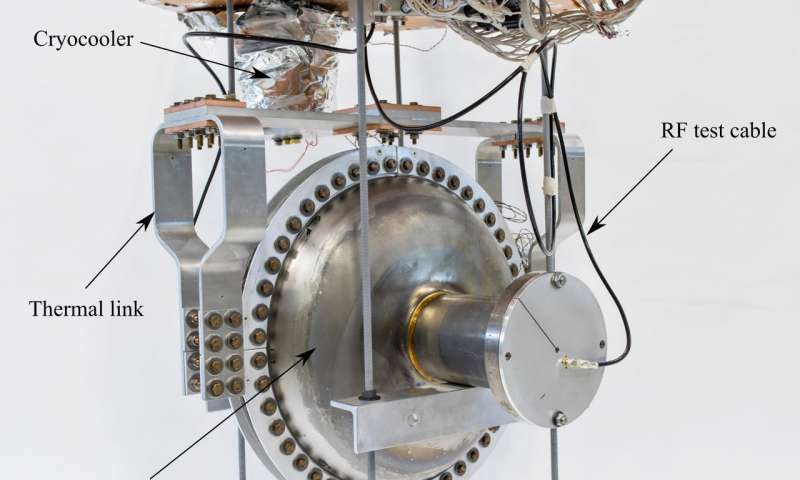 As with any exciting experiment, connecting the cavity to the cryocooler was a significant task that required investigating various materials and designing custom components. Our team produced niobium conduction rings and connected them to the cavity shell using electron-beam welding. They also developed niobium-aluminum joints that allowed heat to flow easily from the cavity to the cryocooler. To generate heat into the cavity, the team used a simple plug-and-play radio-frequency driver, as in laboratory accelerators. Electromagnetic gradients are generated within SRF cavities; stronger gradients impart more energy to the beam. This first-ever cryogen‑free operation produced a gradient of 0.5 megavolts per meter on a single-cell, 650-MHz niobium cavity. We plan on achieving gradients up to 10 megavolts per meter by using higher-capacity cryocoolers and capitalizing on other recent advances in cavity technology. The team is exploring the application of conduction cooling technology to higher frequencies, multicell cavities, and other radio-frequency structures. 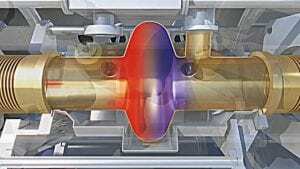 Replacing liquid helium with plug-and-play cryocoolers makes SRF accelerators accessible to industry by making accelerators into simple, turn-key systems. (content credit: November 28, 2018, Fermi National Accelerator Laboratory, phys.org/news). [Stuart, Florida, November, 2018, coaxicom.com] – Coaxicom is located in Stuart, Florida and serves the military/defense, aerospace, medical, telecom, wireless, energy and transportation industries for over 30-years. And we are proud to have a long tradition of serving NASA, U.S. Navy, top universities, telecommunication innovators, and several National Research Labs. Not only do we offer quality connectors, adapters, phase adjusters, terminations, attenuators, and dust caps. We can also design most any type of cable assembly and unlike other companies, we accept low quantity orders at competitive pricing. But what makes Coaxicom so unique is the kind of quality, expertise and support that should be expected from a components manufacturer in the United States. Our team is small and smart with decades of experience in engineering. machining, assembly and quality control. Our mission is to provide real long-term solutions that are easy to find and easy to buy! See what some of our customers think. Click here for testimonials and feedback.